During the winter season I like to prepare rustic recipes from the French countryside. These hearty dishes are made with staples from the land, such as potatoes and root vegetables, bitter winter greens, cured meats and cheese. 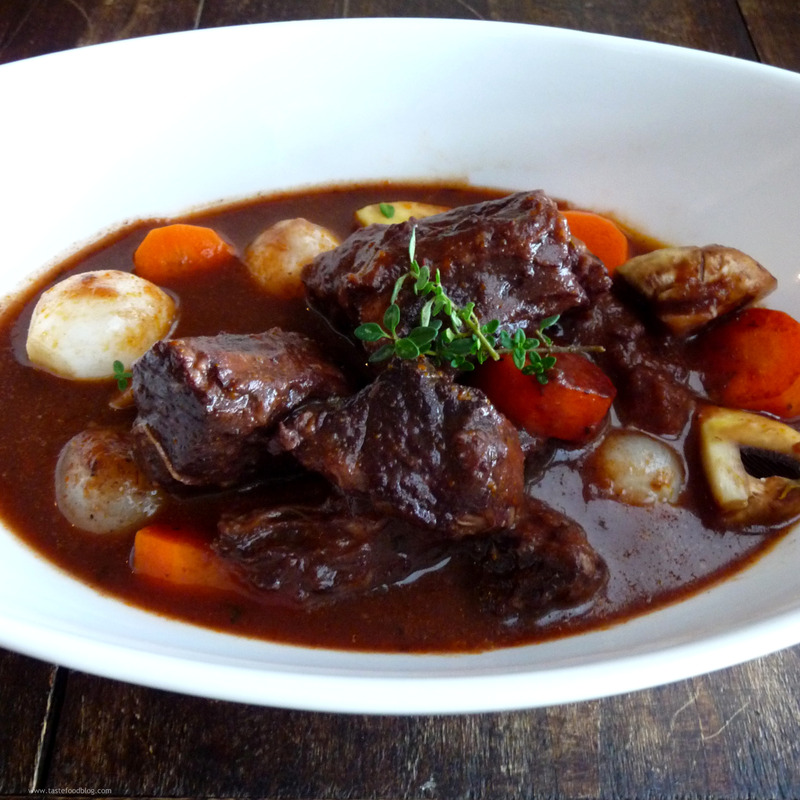 My favorite is beef bourguignon, a stew consisting of a tough cut of beef slow-cooked in Burgundy wine until falling-apart tender, mingling with carrots, onions and mushrooms in a rich, savory stock. It’s a delicious one-pot meal perfect for a cold night or an apres-ski meal. It can easily be made in advance, and like most stews, tastes even better the next day for easy planning. Enjoy with a glass of red wine, a roaring fire, friends and family. 1. Heat 2 tablespoons olive oil over medium-high heat in a large oven-proof pan with lid or Dutch-oven. Season the beef with salt and pepper. Working in batches, add the beef to the pan, without over-crowding, and brown on all sides. Transfer to a bowl and repeat with the remaining beef. 2. Add the cognac to the same pan and deglaze over medium-high heat, scraping up any brown bits, and reduce by half. Pour the cognac over the beef and set aside. 3. Preheat the oven to 325 F. (170 C.) Coarsely chop 2 carrots. Heat 1 tablespoon olive oil in the same pan. Add the chopped carrots, the garlic, and onion. Sauté over medium heat until slightly softened, about 3 minutes. Return the beef and any collected juices to the pot. Add the wine, stock, tomato paste, and thyme. (The beef should be covered by the wine and stock. If not, add more wine or stock to cover.) Bring to boil, then reduce the heat to low. Cover the pot and transfer to the oven. Cook until the meat is very tender, 2 1/2 to 3 hours. 4. About 30 minutes before the beef is finished cooking, cut the remaining carrots into 1/2-inch slices. Saute the carrots in a skillet with 1 tablespoon oil until bright in color and crisp-tender, about 3 minutes. Transfer to a plate. Add the onions and mushrooms to the same skillet and sauté until lightly golden and crisp-tender, about 3 minutes. Remove from the heat and set aside. 5. Remove beef from oven. Pour the stew into a large strainer set over a bowl. Remove the meat from the mixture and return to the Dutch oven, then press down on the cooked vegetables in the strainer to extract as much juice as possible. Discard the solids. 6. Pour the strained liquid into a saucepan and bring to a boil over medium-high heat. Simmer until the liquid is reduced by half and has a sauce consistency, skimming the fat from surface. Add the sugar and season to taste with salt and pepper. Pour the sauce back over beef and add the carrots, onions, and mushrooms. Bring to a simmer to heat through, then serve. Note: Beef bourguignon can be prepared up to 2 days in advance. Cover and refrigerate. Remove solidified fat from surface before reheating. Reheat over medium-low heat on stovetop, or in a 325 F oven. This is just about my favorite winter dinner – love that it can be prepared ahead of time and the flavors actually improve. Happy New Year! Happy New Year to you, too, Liz. Looking forward to your visit! Great post! I love seasonal dishes. This is perfect for this time of year. Winter is the best for wonderful stews. One of my favourite winter warming dishes, photograph is super. This really looks amazing. Very nice recipe. Happy New Years! Oh my, sounds absolutely wonderful. Big hearty stews are perfect for January… especially for me when I get the winter-lazies and I don’t want to do too much fussing. I’ve never made this before and I should considering my love for wine sauces. Glad I found your site; amazing, simply amazing pictures and your food looks and sounds to-die for! Fantastic! I added a handful of spinach; and then we ate it with mash potatoes with the skin on. Great hearty meal! thank you!